Property Details: 4 Bedroom, 4 Bathroom Property with approx. 2004 square feet. 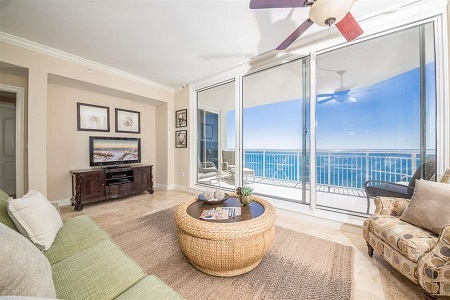 Indigo condo for sale in Perdido Key. West-end residence with glorious Gulf of Mexico views from a spacious balcony! Decorated in coastal style, this well-appointed 4br/4ba furnished residence has never been rented by the current owners and is move-in ready! Designed with privacy in mind, elevators whisk you to your personal entry lobby (elevators can be security-coded if desired). This beautifully decorated residence is enhanced by quality interior finishes such as travertine flooring in the main living area, granite countertops in kitchen & baths, tiled showers, smooth ceilings, and crown molding. Indigo’s lush tropical landscaping greets you as you pass through the gates of this prestigious complex located directly on the Gulf of Mexico and in the heart of Perdido Key. Indigo’s resort-style amenities include a 6,000 sq. ft. zero-entry pool, gazebo, grilling areas, social room with caterer’s kitchen, theater, exercise room, steam/sauna and tennis courts. Covered garage parking, climate-controlled owner storage and on-site management make indigo the premier beachfront condominium in Perdido Key!